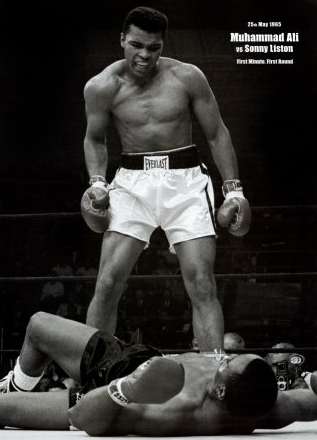 From the red corner, he is fast, he is quick and he is the best boxer in his time thats right he is MUHAMMAD ALI!!! He is the best in the world and this is his story (well I think). When Muhammed was only twelve years old in the American state of Kentucky someone stole his bike. So he went to a nearby gym to ask for some help. While he was there he saw some men boxing and he thought he would like to try it. He trained hard for six weeks and after that he won his first fight. Ali's parents called him "CASSIUS CLAY" but he changed his name to Muhammed Ali when he became a Muslim in 1964 when he was twenty-two. In the year he became a Muslim is the same year he beat Sonny Liston for the Heavyweight Campion of the World. The cool thing about this fight is that he beat Sonny Liston first minute first round. After he became a Muslim he refused to be in the army and that is what made him very unpopuler. His world title was taken away from Joe Frazier in 1967 and wasn't aloud to box for three years. When wasn't aloud to box again, he tried to get his title back but he lost to Joe Frazier. He had another try in 1974 and he beat Goerge Foreman ( another really great boxer) to show he was still the greatest. He liked making up sayings. He told everyone "I am the greatest. I float like a butterfly and Sting like a bee. Ali stoped boxing. He had now won 56 fights with 37 knockouts. He lost 5 times, he is the only boxer to win the world heavyweight campion three times. In 1984 Ali was sick with Parkinsons Disease, but he still travels the world meeting his many fans. Muhammed Ali was chosen to light the flame at the Olympic Games in Atlanta in 1996. 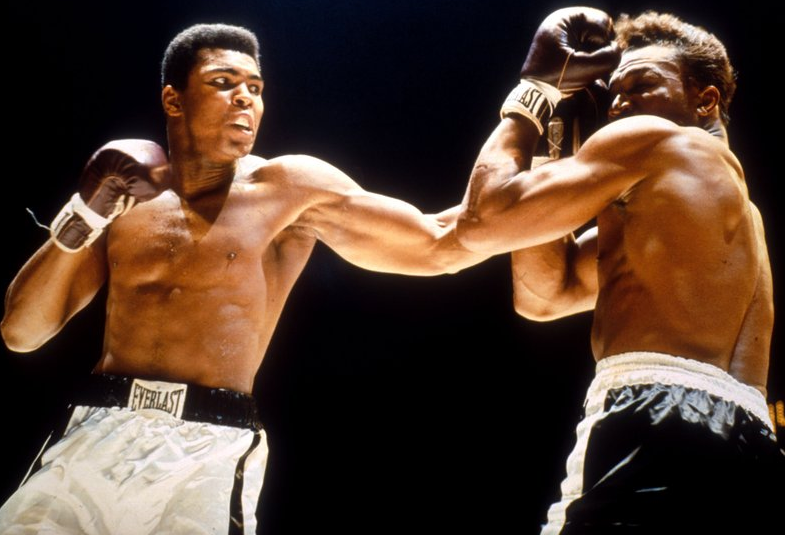 Did you know that Muhammed Ali used to tell people in which round he would win in. When he boxed the British Champion, Henry Cooper, he said he would win in the fifth round and he did. 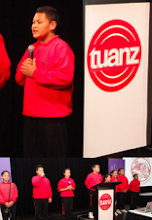 Just when term 1 finished me and my family went to Camp Adair in Papakura to have our family reunion. We also made it a camp but it was one day which was Friday and Saturday. First me and my family had to wake up early to have a shower and get changed. We had to go to my Nana and Grandpa's house because that was where the shuttle. At the back of it was a thing to put our bags and blankets in. We had a little play around before went into the shuttle to go to my FAMILY REUNION!!! When we went inside the shuttle we were singing songs. After that we looked on my uncles laptop to watch his sons boxing fights and some movies so we wouldn't get bored. We finally got there and my auntie, my uncle and my cousins were already there because they were hosting it this year. Last year it was me and my family. The camp site was really cool and looked really nice. While we were playing around and looking for what cabins we were going to sleep on, the guide guy (I can't remember what his name was) came to tell us all the safety things and we all had to be quiet to listen carefully. He finally finished and then we carried on playing. My other cousins came with their rugby ball and we went to the camp-site so we can play touch. We had half time and we went into any cabin to have a rest in and my auntie came in and said "OK this is the cabin all you boys are sleeping in" and we said "OK" and the girls slept in another cabin. My uncle had a stick and a whistle. He had it because when he blew the whistle and hit-ted the pole we would have to go to the camp-site, and the last person to get there would have to sing a song. The first people to sing was my cousin and my brother. That was finished and my uncle had a little talk about when lunch and dinner was at. I was dinner time and my uncle made his butter-chicken and I took a lot of that. After our feed we had to get changed because we had to do performances, and so we all went to get changed. We all got changed and my uncle hit the pole and blew the whistle and my auntie that was hosting it was last and she sang the alphabet. After that my uncle put numbers in his hat to see who goes first and we got out number two and so we went second. after my auntiew and uncle finished it was our turn to do our performances. We got up and my mum introduced us to them and then of we went with our performance. We all finished and then we got changed back into play around clothes. It was getting dark so I put on my track pants and jumper then went to the hall to hang out with my cousins. We played on the laptop and played some music. My other cousins started to come and my brother and sister came so well all hanged out there till my auntie told us to go sleep. We went to sleep. That same night we all stayed awake and my brother and cousin went to scare the girls in the other cabin and me and my cousins were on the look out to see if any parents were coming. It was the next morning and we did this excercis and we called Shock Your Body and then we started doing that. When we finished our excercis my auntie and uncle came to give us some easter eggs. We went back to our cabins to get ready for a volley-ball game. We got there and started to play. While we were playing my uncle aksed us if we wanted to go on the mud-slide and straight away we all said yes but all the people that wanted to finish of the volley tournament stayed. We all got changed and went to the mud-slide. My first go was cool because I was sliding and then I wooped in to the mud-water. When we finished the mud-slide we all packed up and had one more liitle feed before we went home. Our shuttle got here and then we went home. I had a very fun time at Camp Adair I would love to go there again, IT WAS AMAZING. "Mrs. Squires this water is cold as" I said to Mrs.Squires. For two weeks Room15 and Room17 have been going to swimming at the pools, I was so excited. I got changed and went to the pools and Mrs. Squires told us that we could put our feet in the pool. When I put my feet into the pool I felt very excited because I have not been in the pools since last year. My favourite thing was when we did the freestyle because I learnt it fast. At at the last day of swimming we got to have free time because we never had free time on the other swimming days. I can't wait till next years swimming.